The tibial nerve, posterior tibial artery, tendons of the tibialis posterior, flexor digitorum longus, and flexor hallucis longus travel in a bundle along this pathway. Tarsal Tunnel Syndrome - A condition in which the tibial nerve is irritated as it travels through the tarsal tunnel (along the inner leg behind the medial malleolus). Inside the tunnel, the nerve splits into three different segments. One nerve (calcaneal) continues to the heel, the other two (medial and lateral plantar nerves) continue on to the bottom of the foot. Patients with tarsal tunnel syndrome typically present with numbness and pain in the foot radiating to the big toe and the first three toes. If the muscles of the foot have a compromised blood-flow, it may create a cramping feeling. A positive Tinel sign on the medial side or symptoms during a straight leg raise test may be indicative of tarsal tunnel syndrome. Massage Therapy for Tarsal Tunnel Syndrome? 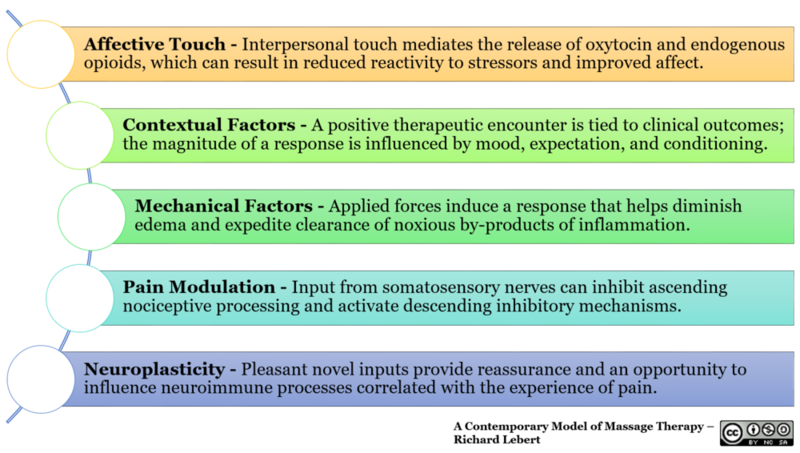 The responses to massage therapy are multifactorial - physiological and psychological factors interplay in a complex manner. The biopsychosocial model provides a practical framework for investigating the complex interplay between massage therapy and clinical outcomes. Based off the biopsychosocial model, investigation into mechanisms of action should extend beyond local tissue changes and include peripheral and central endogenous pain modulation. An observed favorable outcome may be explained by a number of overlapping mechanism in the periphery, spinal cord, and brain represented in the image below. Abouelela, A.A., Zohiery, A.K. (2012). The triple compression stress test for diagnosis of tarsal tunnel syndrome. Foot (Edinb). Alshami, A.M., Souvlis, T., Coppieters, M.W. (2008). A review of plantar heel pain of neural origin: differential diagnosis and management. Man Ther. Basson, A., Olivier B, ... Mudzi, W. (2017). The Effectiveness of Neural Mobilization for Neuromusculoskeletal Conditions: A Systematic Review and Meta-analysis. J Orthop Sports Phys Ther. Ferkel, E., Davis, W.H., Ellington, J.K. (2015). Entrapment Neuropathies of the Foot and Ankle. Clin Sports Med. Kavlak, Y., Uygur, F. (2011). Effects of nerve mobilization exercise as an adjunct to the conservative treatment for patients with tarsal tunnel syndrome. J Manipulative Physiol Ther. Kinoshita M, Okuda R, Morikawa J, Jotoku T, Abe M. The dorsiflexion-eversion test for diagnosis of tarsal tunnel syndrome. J Bone Joint Surg Am. Kinoshita, M., Okuda, R., Yasuda, T., Abe, M. (2006). Tarsal tunnel syndrome in athletes. Am J Sports Med. Meadows, J.R., Finnoff, J.T. (2014). Lower extremity nerve entrapments in athletes. Curr Sports Med Rep.
Pomeroy, G., Wilton, J., Anthony, S. (2015). Entrapment neuropathy about the foot and ankle: an update. J Am Acad Orthop Surg. Tu, P. (2018). Heel Pain: Diagnosis and Management. Am Fam Physician.